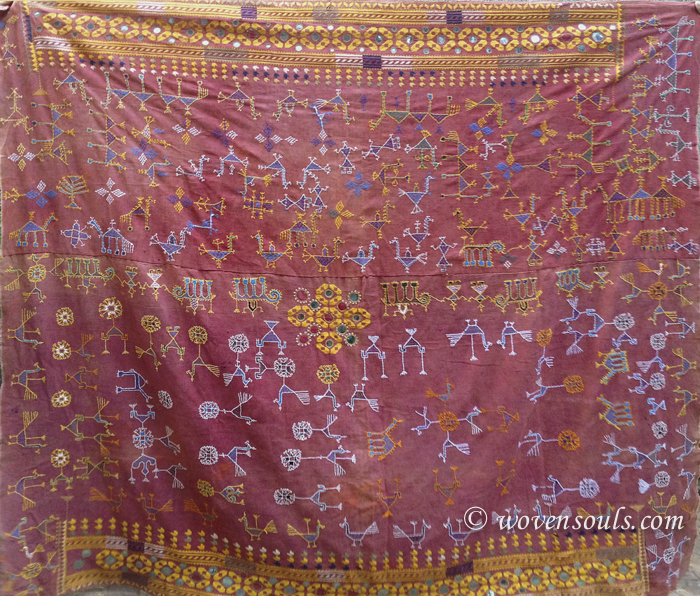 Born Free ……A Group of 4 Textiles with a Wild Spirit! 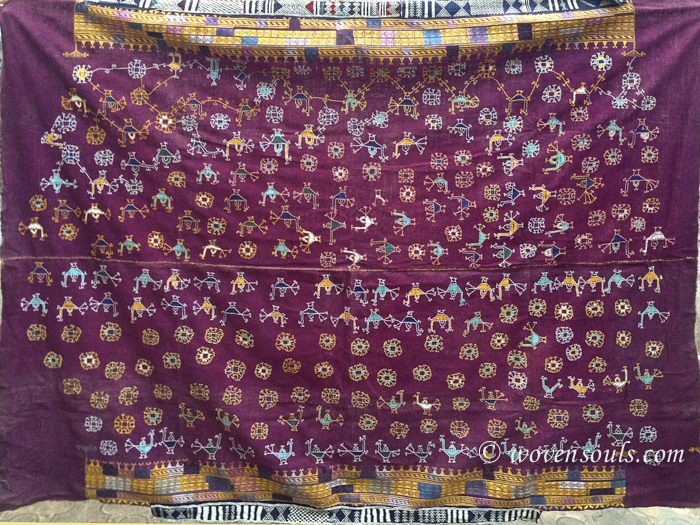 Here is a group of Odhanas [shawls that cover the head and body] from Rajasthan, with a Khadad (handspun coarse thick cotton) base in rust or aubergine, embroidered with cotton thread. 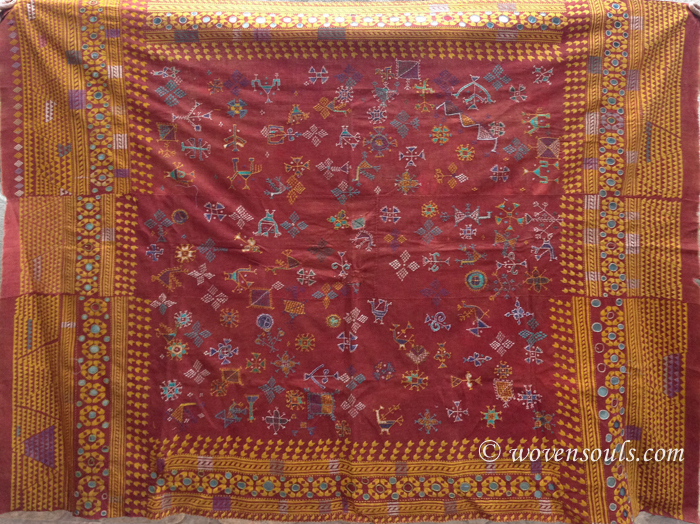 Yellow borders are common in shawls from the Shekhawat region and the Bishnoi community. 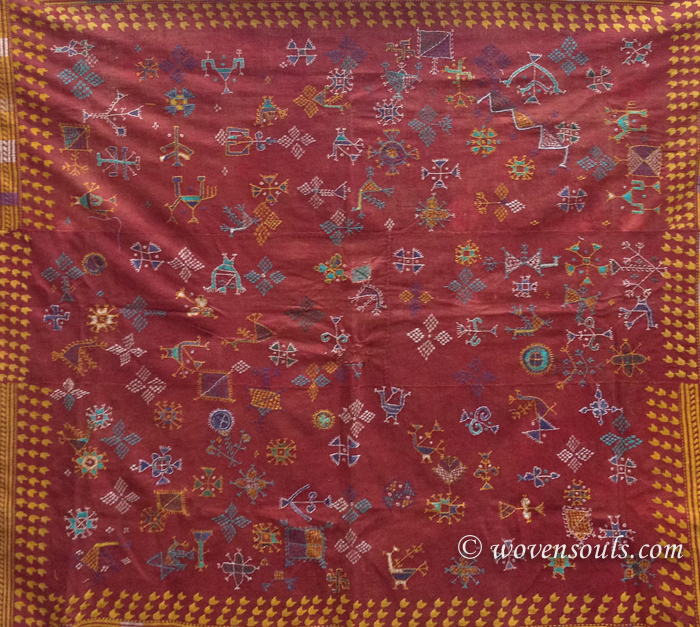 Seen in this group of 4 textiles, is the spirit that is free, wild, unfettered and unrestricted! 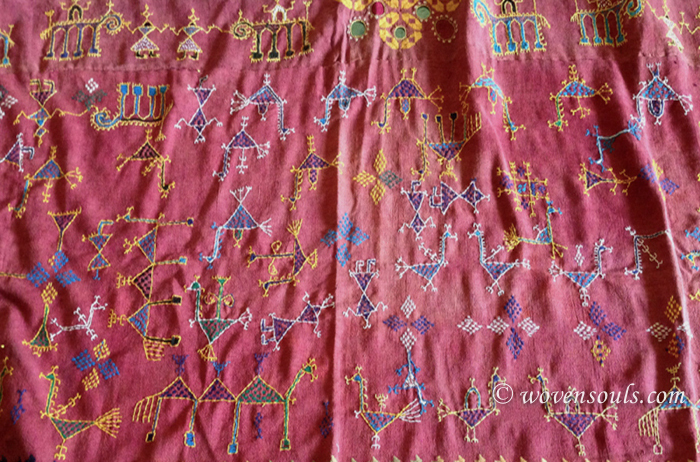 The character of the textile reflects the lifestyle of the creators – the Bishnois – who live as one with nature and their surroundings. 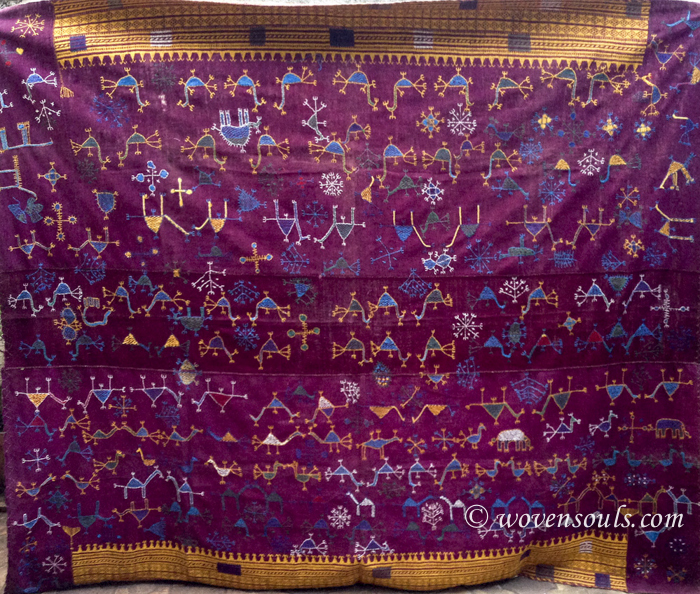 The commonality across the four textiles – the use of an unusual color and the randomness in the layout – suggest that all four originate from the same village or sub-tribe. These pieces are among the simplest and most rustic in my collection. Yet they make me so proud to know them and to behold them! There is something very special going on in them – their innocence, their naivete – that warms my heart. 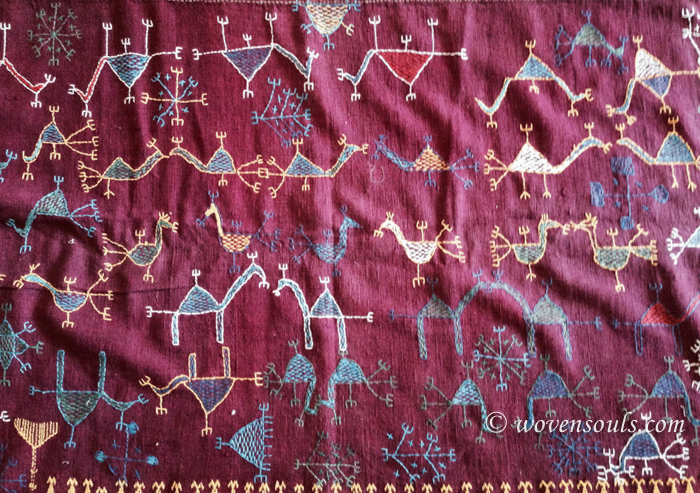 It is a pleasure to study these and wonder about their creation! 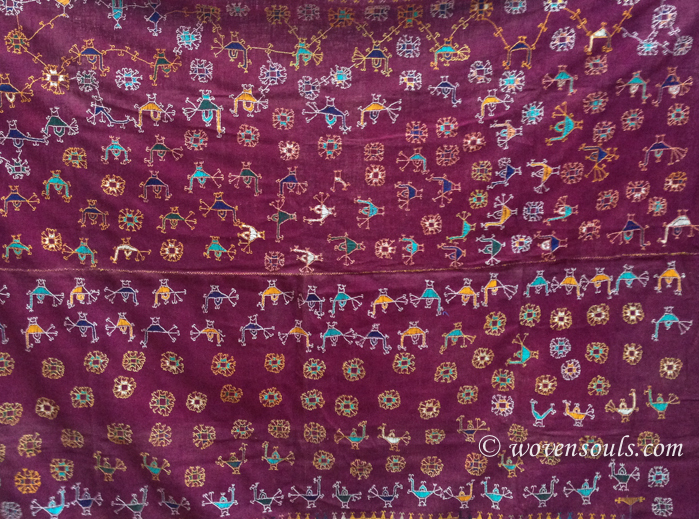 This entry was posted on March 16, 2015 by wovensouls in Art Kaleidoscope and tagged antique Asian textiles, antique tribal textiles, Asian textiles, BISHNOI TEXTILE, creativity, folk art, free thinking, gypsy textile, herder textile, imagination, naive art, Nomadic textile, odhana, rajasthan textiles, rural art, rustic art, Tribal art, tribal textiles.